Today’s Strawberry Mango Summer Salsa recipe definitely meets my requirements for really tasty salsa. While I use salsa a lot in savory recipes because I love the flavor and body it adds to recipes, I don’t often eat salsa as intended—on its own, usually with tortilla chips. There are two exceptions, however. One exception is my friend Tavie’s homemade salsa. Tavie is from New Mexico and she excels in all dishes with a Mexican flair. (You might remember her Homemade Sangria and Green Chile Chicken Casserole recipes.) Tavie’s homemade salsa is truly to die for especially when served with her homemade tortilla chips. One simply cannot stop eating it! The other exception is a good salsa that includes fruit … peach salsa, mango salsa, pineapple salsa. If there’s a fruit factor, I’m . And now this Strawberry Mango Summer Salsa. The combination of “sweet” and “heat” has always been an unbeatable one to me. Admittedly, that has a lot to do with the fact that I have a sweet tooth, but it’s also because I can’t tolerate too much heat and the sweet nicely tempers the heat. The sweetness not only helps subdue the heat some, it also complements the heat factor so nicely. For this reason, I’ve also been known to add a bit of the sweet to spicy pots of chili. Like Sweet Potato Bacon Chili. Yum. Now I want chili! But let’s get back to this Strawberry Mango Summer Salsa, shall we? I think this salsa recipe is much better suited to today’s weather, and to summer entertaining in general. I’m one of those weird people who is not normally a big fan of strawberries (well, unless they’re in daiquiris!). I don’t find them particularly sweet and I’m not crazy about their texture (this is my ongoing issue with berries in general), but they work really well in this recipe. The other ingredients are mango, avocado, onion, jalapeno, cilantro, lime, and salt. Really great ingredients, right? Of course, avocado is not often included in salsa recipes, but I love it when it is. I’m a big guacamole lover, so I welcome the avocado in this salsa for adding the “guac factor” and for being another method of softening the heat. I love enjoying a good, fruity and spicy salsa when we’re camping—as part of our lunch or as the first course of our dinner, while potatoes are baking in the coals and artichokes are steaming. Friends and family are often doing their own thing when we’re camping, but they’re lured in by good salsa! 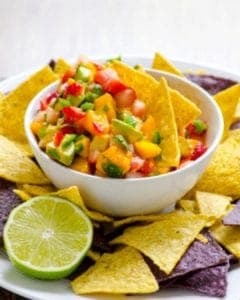 The folks at RW Garcia Snacks shared this Strawberry Mango Summer Salsa recipe with me. RW Garcia is a family-owned operation that offers high quality, artisan-style tortilla chips and crackers. They sent the recipe to me for International Picnic Day, which was observed on June 18. While that’s long gone, I kind of feel like every day of summer is picnic day though. 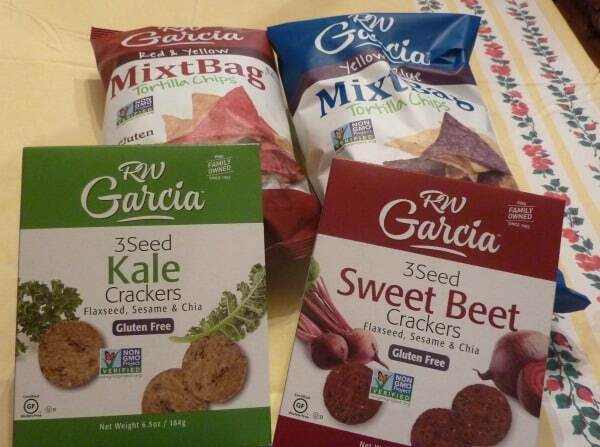 RW Garcia also sent me some complimentary products: their tortilla chips and crackers. The tortilla chips I received were their MixtBag of Yellow & Blue tortilla chips (shown in the photo above) and their Yellow & Red tortilla chips. Both are terrific. They’re a heartier, more wholesome chip than the typical tortilla chip. I love their taste, sturdiness (I hate it when tortilla chips break on me! ), and their crunch. The red chips in the Yellow & Red tortilla chips get their coloring naturally from beets, but there is no beet taste in these chips. The blue chips in the Yellow & Blue tortilla chips are blue corn chips. I’ve always loved those! The crackers provided were 3 Seed Sweet Beet and 3 Seed Sweet Potato. They’re still in the pantry because they include chia seeds and I can’t tolerate chia seeds at the moment. I’m sure Mr. GFE or Son will enjoy them though! All of RW Garcia’s products are made from stone-ground non-GMO corn (primary ingredient), contain no additives or preservatives, are verified non-GMO, and are certified gluten free. Gotta love all that! I’m looking forward to trying their new Pulse tortilla chips, which will debut soon. The flavors are Black Bean & Garlic, Lentil & Turmeric, and Hummus & Red Bell Pepper. Now … Strawberry Mango Summer Salsa and chips, anyone? Or perhaps crackers? I’m a chips gal when it comes to salsa—unless there are no chips on hand. In that case, crackers will suffice just fine! A fruity salsa is wonderful for summer! The sweetness both softens and complements the heat factor. Add ingredients to medium-sized bowl and gently mix. Adjust salt and spiciness to taste. Dollop onto cracker or scoop up with chips. What a colorful and tasty looking salsa. I could think of so many ways to use it- Maybe as a topping for cold soup or on some gluten free crackers. Great recipe for this summer would make it as soon as possible because i love Mangoes very much. This looks really good. I saw your FB post, feel better soon!! !